After Two Years In Hiding, A Bahraini Blogger Escapes : Parallels Ali Abdulemam was perhaps the most prominent online activist in Bahrain when he went into hiding in March 2011 to avoid arrest. He recently escaped the Gulf nation and made his first public appearance in more than two years on Wednesday. 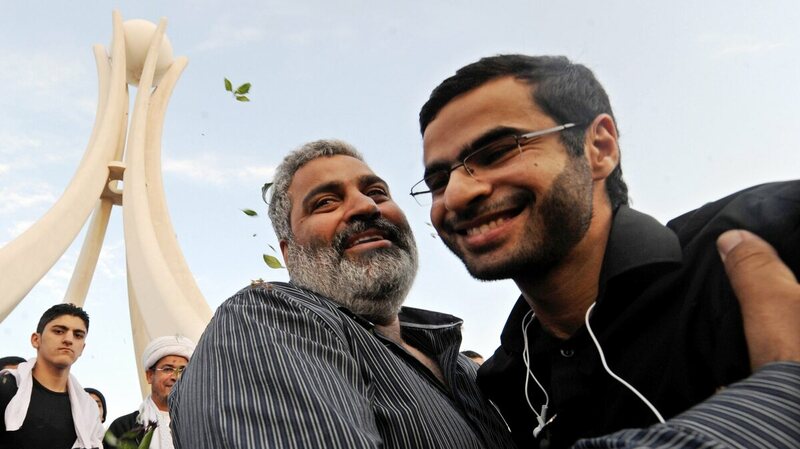 Online activist Ali Abdulemam (right) is greeted in Manama, Bahrain, on Feb. 23, 2011, shortly after anti-government protests began. Wanted by the government, he went into hiding the following month. He escaped from Bahrain after two years underground and made his first public appearance Wednesday in Oslo, Norway. The Arab world was aflame in March 2011. Longtime rulers in Tunisia and Egypt had been toppled. NATO was poised to attack Libyan government forces. The Syrian uprising was just beginning. And on the small island nation of Bahrain, the government was cracking down on pro-democracy protesters. Across Bahrain, protest leaders were rounded up and some were quickly tried, convicted and sentenced to prison. The writing was on the wall for the leaders of the movement, including Ali Abdulemam. He was perhaps the country's most prominent online activist. More than a decade earlier, he had founded the first online forum critical of the Bahraini government, Bahrain Online. Abdulemam, who went into hiding at that time, made his first public appearance in more than two years when he showed up at the Oslo Freedom Forum in Norway on Wednesday. He sat down with me and his friend, fellow activist Nasser Weddady, and recalled this nightmarish period. Back in 2011, Weddady was watching the crackdown from afar in Boston and was worried about his friend. "I began to see the telltale signs," Weddady says. "My first concern was to get in touch with Ali, first of all to make sure he wasn't detained and then to warn him. I called frantically in the middle of the night and basically told him, 'Ali, get the hell out of Dodge. They are coming for everybody.' But since then I've learned that this warning didn't sink in with him." Across the table, Abdulemam smiles somewhat uncomfortably. "Well, it was 3 a.m.," he says with a laugh. "Nasser woke me up; he called many times until I woke up. He told me they were raiding houses and you needed to get into hiding. I tried to explain to him, in the street it's martial law, no one can go out. It was dark outside, no light at all. He just couldn't listen; he just kept saying, 'You have to get out now.' So I said, 'I'll see what I can do.' Then I continued sleeping." By next morning, though, Abdulemam realized the gravity of the situation. "When I woke up, I read the news that they raided the houses of most of the activists. So it wasn't hard to expect them to come for me in the next few hours or days." "That night, I slept in another house," Abdulemam continues. "The next morning I got the news that they raided my house. They turned it upside down. And then I made some contact to find a safer place." When Abdulemam arrived at that safe house, he had no idea that he would remain in complete hiding for more than two years. For months, friends and colleagues searched for Ali to no avail. The government sentenced him to 15 years in jail in absentia. No one, including his family, knew what had happened to him. Abdulemam was off the grid. Maintaining complete silence was difficult. The hardest part, he says, was being unable to help friends and colleagues as the government crackdown continued. "It wasn't easy," Abdulemam says. "It's like a heavy stone on my chest; I cannot breathe." The crackdown continued after Abdulemam went into hiding. Several leaders of the opposition movement were arrested, tortured and given life sentences in jail. At least two of his friends were tortured to death by police, he says. Doctors who assisted injured protesters were fired and even arrested, according to human rights groups. An independent commission documented 46 deaths and more than 500 cases of torture at the hands of the government. Government critics say no meaningful reforms have been undertaken despite the report. Abdulemam eventually managed to reach out to Weddady and make what he described as "very, very restricted contact" with him. "I got a message, without saying his name," Weddady explains. "I immediately understood who this was, but my biggest fear was that I was talking to somebody under arrest, and that this was a way to further dig him deeper into a hole. So through our exchange, there were coded references to things that only the two of us would know. I was finally certain this was Ali Abdulemam." For months, Weddady kept Abdulemam's secret to himself, giving no hint of what he knew. "Mutual friends would come to me and ask for news," he says. "'What's up with Ali?' they'd say. And the hardest thing was to look at them and say, 'I dunno.' "
Weddady discreetly began making contacts to see if anyone could help get him out of Bahrain. U.S. government officials were sympathetic, he says, but they told him that Bahrain was a sovereign country and Ali was a citizen of Bahrain, so there was little they could do. Weddady eventually made contact with Thor Halvorssen of the Human Rights Foundation. Halvorssen decided he would organize a rescue effort — and a bold one at that. Taking a cue from the movie Argo, he put together a camera crew that would film a fake documentary in Bahrain. Just before leaving the country, Abdulemam would swap places with a lookalike member of the crew and, if all went well, he would escape. The plan was within weeks of implementation when Weddady lost contact with Abdulemam. "At one point, communication stopped," Weddady says. "I went bananas." Little did he know at the time that yet another group of activists had agreed to smuggle Abdulemam out of the country. Neither of them would go into details about how the actual escape transpired — they're both concerned it could compromise other activists from making similar escapes — but other news outlets including The Atlantic have reported that it involved hiding in a secret compartment inside a car and driving across the causeway that links Bahrain to Saudi Arabia. After several harrowing days, Abdulemam made it to London, where the British government granted him political asylum. One of the first calls he made was to his friend Weddady. "After a few days I was able to communicate with him," Abdulemam says. "I had a feeling that they were working on something, but I didn't know what it was. But he was with me from the beginning, so he should be the first one to know that I made it out." Meanwhile, Abdulemam made another phone call: to his wife and three children, who he hadn't seen in two years. He's now working to bring them to Britain. "Hopefully we'll be reunited very soon," he says.